Proceed to the passenger and vehicle drop-off area in front of the Customer Reception Unit. The Duty Manger will greet you and present you with a return card, featuring your vehicle identification. 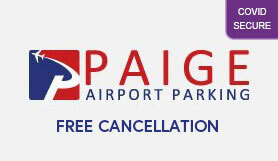 Paige's drivers will load your luggage into a fully enclosed trailer, allowing you to board our shuttle luggage free. Your shuttle will depart as quickly as possible, and always within 20 minutes.